Pie CuriousIn Pie Curious, The Takeout solicits the help of pastry chefs to teach all-thumbs baker Gwen Ihnat how to master the mighty pie. 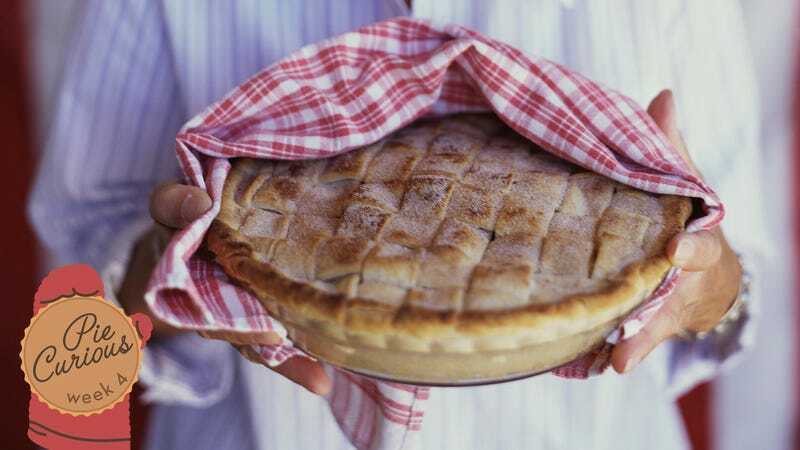 In this month of pie-crust making, it has literally been one step forward, one step back. Did well with a butter crust, fucked up on lard. Tried lard again, with great results. This week, I have a new enemy: Crisco. My pie this week was not the calamity of the pencil-shaving-esque quiche of week two, but it had a similar crumbling problem. Whenever I’m piecing things together in a pie pan, I know that failure is imminent. But turns out that I was my own worst enemy, although it took me a while to figure that out. It’s really too bad, because things started out so lovely, as Bo Durham of Mindy’s HotChocolate bakery in welcomed me into his 20th-floor kitchen at Chicago’s Revival Food Hall downtown. He had prepared pie crust cookies (sugar and caramel nut) and even a full pie for me to take home, which is without a doubt one of the greatest things I’ve ever eaten. Unfortunately, it is that pie I tried to replicate, with ultimately ill results. Bo said that his parents ran a catering company, so he spent summers clearing tables and working the salad station, before discovering his love for pastry working at Chicago chef Mindy Segal’s Mindy’s HotChocolate. He was enthusiastic about using Crisco in his crust, alongside butter: “My one friend’s mom makes hers with all Crisco and it’s some of the best pie I’ve ever had in my life.” Like the lard, the good thing about Crisco is that it’s so pliable, not like butter where you have to beat it into submission. I had to appreciate Bo’s faith in me: The filling—a chocolate custard—seemed almost as daunting as the pie crust itself. He easily whipped up a massive amount of pie crust dough in his mixer and confidently rolled out a previously chilled batch. Then he showed me a trick that made me lose my mind: Flipping the pie plate upside down and using a larger circle to cut before putting the crust in the plate. Since I’ve been having such a hard time cutting my crust around the pan, I thought this method was particularly noteworthy. He also introduced me to just using any household items around as pie weights, like beans or rice on parchment. His end result was a thing of beauty, so delicious and rich that I could barely finish a entire piece (although believe me I tried my hardest). With all of this backup, I was super-excited to tackle Bo’s pie. Unfortunately, I fucked up almost instantly, and this time, unlike when I used the wrong lard, I couldn’t figure out where I’d gone wrong, This crust was so close to being perfect, but was way too crumbly. It was fairly play-doh pliable, as I’ve been taught, but it seemed to have a hard time sticking everything together. I foolishly thought that that chilling it might help. Fool! Here’s a valuable pie-making lesson I have learned: If your dough is crumbly pre-chill, it will be crumbly post-chill. There was a certain step I was missing and/or had fucked up, and I just couldn’t figure out what it was. Unsurprisingly, I had a tough time with the crust again post-chill. You got the feeling that it really wanted to be solid, but just couldn’t get it together. I could totally relate. But I pieced it together as best I could and then put it in the oven, using rice as pie weights, as I’d been taught. I then turned my attention to the custard, unfortunately another thing I’ve never made before. There, it was very clear where I went wrong. Despite my frantic whisking, as I stirred the egg yolks into the heated up cream, milk, salt, sugar, and vanilla, they started to curdle. Damn it. This dessert was shaping up to be the worst thing anyone had ever created. Not just me, but anyone in the history of the world. It tasted great, but the curdles really detracted from the overall enjoyment. Fortunately, my genius husband helped me push all the custard through a sieve, and the custard was saved! The crumbly pie crust, not so much. Depressed and disappointed I reached out to Bo, who nicely took even more time out of his busy day to call me and help figure out where I went wrong. He was almost as sad as I was: “I thought my method was foolproof!” I assured him he was dealing with a rank amateur who barely deserved to even step into his fine kitchen, and continued to describe my woeful pie. Bo diagnosed my problem easily: not enough water. In my worry about making the pie too gummy, I didn’t add enough ice water to keep the whole thing together. He suggesting adding water in multiples of two tablespoons: “Six tablespoons at the most.” My lack of mixing stand might have also been a problem; my warm hands might have been heating up the dough too quickly. To avoid this, Bo suggested what I had been referring to as that “pie thingy,” or a pastry dough blender, which would mix the dough without adding heat. He also suggested using just a pie fork or even a potato masher. He also pointed out that my custard wouldn’t have curdled if I had tempered the eggs, one of the terms I was unfamiliar with: You pour the hot liquid into the eggs a little at a time to prevent them from scrambling. My pie. Sorry about that. It’s true: As dastardly as the crust turned out (the trip on the train to work didn’t help), it actually tasted a lot better than it looked. The Takeout editor Kevin Pang said he’d give it a B-, having to take some points off for aesthetics. But again, most of my other tasters were enthusiastic, with one IMing me, “The crust is pleasingly flakey, even if it’s a bit erratic. I love the creaminess of the filling, and the cocoa flavor. It could stand to be a touch firmer, but that feels like needlessly complaining. I would eat that whole pie given the opportunity.” And honestly, it is a very nice thing to be able to offer your co-workers an afternoon snack of even B- level chocolate pie and whipped cream, which can have the effect of raising the karma level of your day overall. Bo, of course, was right: My mindset while making the pie was less about the love, more about the fear. And look what happened. So I am getting my act together and trying this again next week (after a trip to Target for some pie tools. Maybe even official pie weights). That final, hopefully successful pie will signify the end of this project, as I will leave pie to go off on another culinary journey that’s a bit easier. Like learning how to make that potentially fatal blowfish sushi or something. 1. Dice butter, and portion shortening. Freeze for a couple of hours or overnight. 2. Gather all dry ingredients and place in stand mixer with paddle attachment. Add frozen cubed butter and turn on mixer, starting to break up butter into smaller pieces. 3. After a couple of minutes start incorporating shortening into mixer adding little pieces at a time. Continue to mix, checking butter pieces every so often. Some big and small pieces are okay. 5. Bring dough together, divide into two and form into two packs, wrap in plastic and refrigerate overnight. 6. The next day, pull dough half hour before rolling on a floured surface and roll to desired thickness 1/4" or 1/2" are usually safe. 8. Form pie crust immediately after rolling. Line crust interior with plastic wrap and fill with baking beans. Bake at 350 degrees Fahrenheit for 20-30 minutes. Remove beans and fork bottom of crust. Bake for an additional 5-10 minutes to cook pie crust all the way for a nice light golden color. Cool completely. Fill with desired curd, custard, filling. 1. In a medium sauce pan, place milk/cream/vanilla/salt/and half amount of sugar and bring to a gentle simmer. 2. In a medium bowl add yolks and other half of sugar. Whisk together. 3. Temper warm liquids with the yolks. Add back to pan and cook until thickened, enough to coat the back of the spoon. 4. In a clean bowl place all chocolate. 5. With a fine strainer pour custard over chocolate and whisk to bring together. 6. Pour chocolate custard into cooled and fully baked pie crust. Refrigerate over night until custard is completely set. Finish with fresh whipped cream and chocolate garnishes.